Ten years ago, a boy named Tommy disappeared in a pumpkin patch next to the old haunted house at the edge of town. Every year after that, Tommy waits for someone to come into the pumpkin patch at Halloween to be his companion. 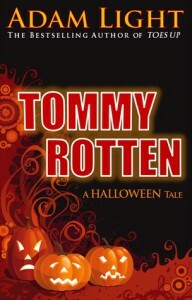 Is this the year that someone dares to enter the old patch filled with rotten pumpkins and the decaying remains of Tommy? Your typical urban legend type of story aimed at a teenage audience. Not bad, but nothing great either.